Ralph Rexford Bellamy (June 17, 1904 – November 29, 1991) was an American movie, television, stage, voice, radio actor, and comedian. He was known for his roles as Randolph Duke in Trading Places and in Coming to America. Bellamy was born on June 17, 1904 in Chicago, Illinois. He was married to Alice Delbridge from 1927 until they divorced in 1930. He was later married to Catherine Willard from 1931 until they divorced in 1945. He was then married to Ethel Smith from 1945 until they divorced in 1947. He was married to Alice Murphy from 1949 until his death in 1991. Bellamy died on November 29, 1991 in Santa Monica, California from respiratory failure, aged 87. 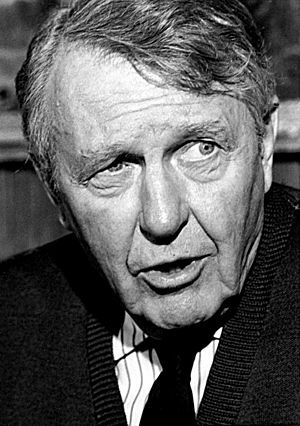 Ralph Bellamy Facts for Kids. Kiddle Encyclopedia.